Join master drummer and multi-instrumentalist Kofi Kunkpe in a joyful music and movement workshop for walkers and their carers. Originally from Cape Coast, Ghana, Kofi is a keeper of his culture who is passionate about sharing the songs, dances, and rhythms of West Africa. 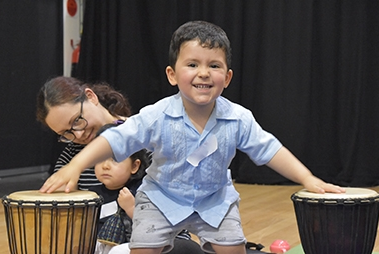 You and your child will groove together, try out some pint-sized percussion, and learn songs you can take home to continue the musical exploration with your little one.